"In Him dwelleth all the fulness of the Godhead bodily," Colossians 2:9. "That in all things He might have the preeminence," Colossians 1:18. Before we begin to speak in detail about this very important subject of the Lord's sinless humanity, it is important to call attention to the glory of His blessed Person. He is the everlasting Word (John 1:1). He is the only begotten Son who is in the bosom of the Father (John 1:18). He is the One by whom all things were created and who upholds all things by the Word of His power (Hebrews 1:2,3). He was the Father's delight from all eternity (Prov. 8:30), and all the angels are called upon to worship Him as Man (Hebrews 1:6). The wise men from the east also bowed and worshipped Him as a Babe (Matt. 2:11). With these thoughts in mind it is surely a most solemn thing to speak of His perfect humanity and we must do it as worshippers, "bringing into captivity every thought to the obedience of Christ." 2 Cor. 10:5. The mystery of His glorious Person is beyond the human mind, as the Word says. "No man knoweth the Son but the Father." Matt. 11:27. Therefore since we only know what has been revealed to us through the Word, it is important that we do not go beyond the Scriptures of truth either in our thoughts or comments about Him. Now we will first notice what the Scriptures tell us about the first man, Adam, in innocency in the garden of Eden. He did not have the knowledge of good and evil before he sinned, but was simply in the place of obedience (Genesis 2:16,17). He did not, when created, have a fallen nature, nor did he have a holy nature, for holiness is abhorrence of evil with delight in good. He had an innocent nature and this he lost in the fall - never to regain it, for he was driven out of Eden, never to return (Gen. 3:22-24). Babies now born into the world are not born with innocent natures but with fallen natures (Psalm 51:5). When the time came that the Lord Jesus was to be born according to the promise, the message to Mary the virgin was, "The Holy Ghost shall come upon thee, and the power of the Highest shall overshadow thee: therefore also that holy thing which shall be born of thee shall be called the Son of God Luke 1:35. He was not innocent, that is without the knowledge of good and evil-He was and is holy. He is the Son of God. He is the "Lamb without blemish and without spot 1 Peter 1:19. The Scripture says, "In Him is no sin," 1 John 3:5 - that is, no sinful nature. He could say, "The prince of this world cometh and hath nothing in Me." John 14:30. The Lord Jesus, blessed be His Name, had only a holy nature as man in this world, as He was holy from all eternity. (Hebrews 13:8, Psalm 111:9). We who are part of Adam's race are all born in sin (Psalm 51:5, James 1:14) and have a fallen nature within us. "That which is born of the flesh is flesh; and that which is born of the Spirit is spirit." John 3:6. It is therefore necessary for a man to be born again to be fit for the kingdom of God. The life which God gives us when we are born again is the life of Christ Himself; so we read "Christ who is our life." Col. 3:4. Now we are told that this life (called the "new man") "is created in righteousness and true holiness." Eph. 4:24. We also read that "Whosoever is born of God doth not commit sin; for his seed remaineth in him: and he cannot sin, because he is born of God." 1 John 3:9. Now these Scriptures make it very clear that God imparts to the believer the life of Christ which is created in righteousness and true holiness, and that it cannot sin. Yet we find those today whom we expected to be clear as to the Person of Christ who teach the terrible doctrine that Christ could sin, although they acknowledge that He did not. Even the thought of it causes deep sorrow of heart to those who love and adore Him as God the Son, A verse that is wrongly used to support this teaching is Hebrews 4:15 where we read. "For we have not an high priest which cannot be touched with the feeling of our infirmities; but was in all points tempted like as we are. yet without sin." Now this verse in reality emphatically denies the thought that Christ could sin. It'is to point out to us that the Lord Jesus as a perfect man felt fully all that a righteous man could feel in this world of sin, yet He Himself was without sin, or "sin apart," (J.N.D trans.). He felt hunger, thirst, weariness, reproach yet was perfectly holy within. When the devil came to Him, as he did in the wilderness in the temptation, there was no response within Him to the temptation, for "in Him is no sin." When He refused to turn stones into bread without a word from His Father. He still felt the hunger for He was a perfect man, and in this way "He suffered being tempted," Hebrews 2:18. This does not for one moment suggest that there was any tendency in Him to disobey His Father. He had taken the place of a man, and thus learned what obedience cost (Hebrews 5:8). It is stated by some that the word "tempt" loses its meaning if it does not imply the possibility of sinning. But this is contrary to Scripture and a terrible dishonour to God, for the Scripture not only speaks of the Lord Jesus as man being tempted, but that men tempted God in Old Testament times (Psalm 95:8,9). Does this suggest that God could sin? May we be preserved from such a dishonour to the Godhead. No true child of God could entertain such a thought unless he has not realized the dishonour to God and to His Son by such terrible doctrine. How could we rest upon His Word for our salvation if this were so? Thank God we are told that "It is impossible for God to lie." Hebrews 6:18. Now the temptation of the Lord Jesus was only to prove who He was as man here. Satan had come with his temptations to the first man. Adam, and Adam had yielded - he fel1. Satan then came with his temptations to the Second Man - the Lord from heaven (1 Cor.15:47) - but he found One here who had only a holy nature and who answered all his temptations as a dependent man should, by the Word of God. When we, as Christians possessing the life of Christ answer Satan's temptations by the Word of God we overcome too. Alas, however, we still have the old fallen nature as well as the new life, so we can yield. "Every man is tempted when he is drawn away of his own lust, and enticed." James 1:14. This verse did not apply to the Lord Jesus for He is God and so we read here. "God cannot be tempted with evil." James 1:13. It may be remarked by some that the Lord Jesus said to His Father in the Garden of Gethsemane, "Not My will, but Thine, be done." Luke 22:42. Now this is most precious when seen in its true light. The Lord Jesus as the Holy One drew back from that place of being made sin, as He was in those three hours of darkness, (2 Cor.5:21). But He was the perfect obedient One who had come to do His Father's will at all cost. And so here light and love shine out in all their splendour - the Lord Jesus abhorring sin, for sin was so contrary to His blessed holy will, yet in love and obedience doing His Father's will in going to the cross to bear it that God might be glorified and sin be put away forever. Instead of trying to fathom the divine mystery of the Person of the Lord Jesus who was perfect God and perfect Man, let us bow in worship like the wise men of old, There are two things dearly taught in the Scriptures: first, the total ruin of the first man through the fall, so that his will is at enmity with God; and second, that God begins again with His blessed holy Son, the Lord Jesus Christ, and His will was only to do His Father's will. When God begins a work in the soul of a man he first gives a new life and all that is acceptable and pleasing to Him flows from that new life. "Which were born, not of blood, nor of the will of the flesh, nor of the will of man, but of God." John 1:13 ... So then they that are in the flesh cannot please God," Romans 8:8. 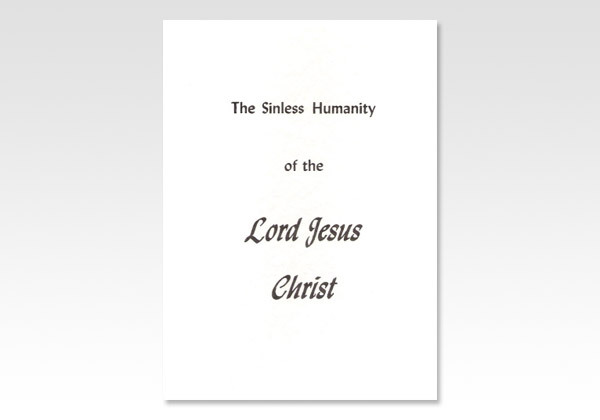 If we are clear as to glorious Person of the Lord Jesus in whom all the fulness of Godhead was pleased to dwell, and as to two natures in the believer, we will no doubt be preserved from the awful error of denying the sinless humanity of Son of God. May the Lord keep the hearts and minds of His people in these days of testing, from anything and everything that attacks the Person or the work of His beloved Son.